The Te xtile and Fibre Art List – a membership organisation of fibre artists and textile businesses on the web. TAFA showcases member portfolios through its website. 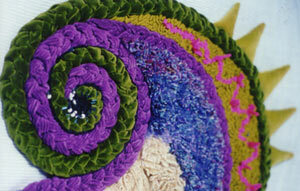 For details of rag rug making and many other arts and crafts courses. Hello Jenni, I have finished a cushion and beginning other work. My problem is how to back them.